I had been gagging to go on the Alps to the Ocean trail for a couple of years. A nice long ride with lot’s of beautiful scenery sounded like my kind of thing. Then I had the idea of taking electric bikes and going the other way so that it was all uphill! Let’s call it Ocean to the Alps and show off what eZee bikes with big batteries are capable of. Maurice agreed and the trip was on – hurrah! 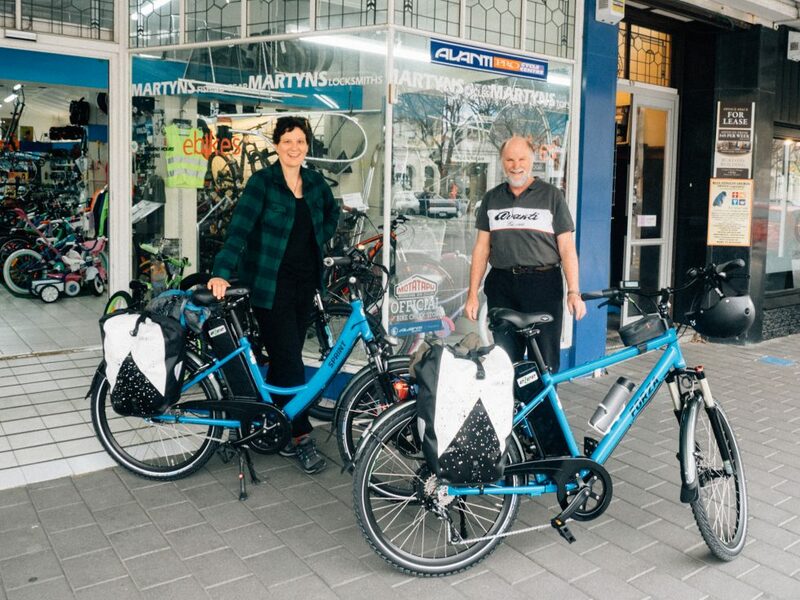 Talia and I started our (epic) journey by picking up a blue eZee Sprint Classic for me and a blue eZee Forza T4 for Talia from the lovely team at Martyns Cycles in Oamaru. 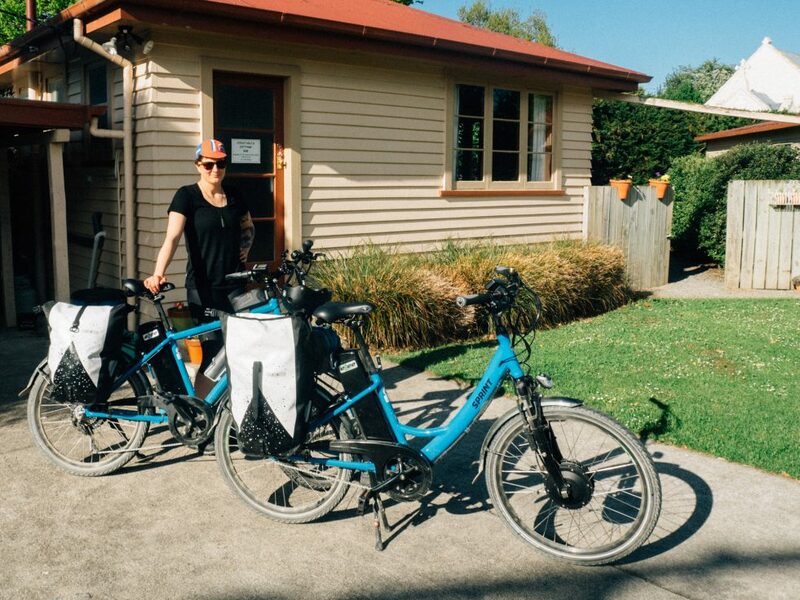 Famous for their personal service and for being New Zealand’s oldest bicycle shop (since 1913). 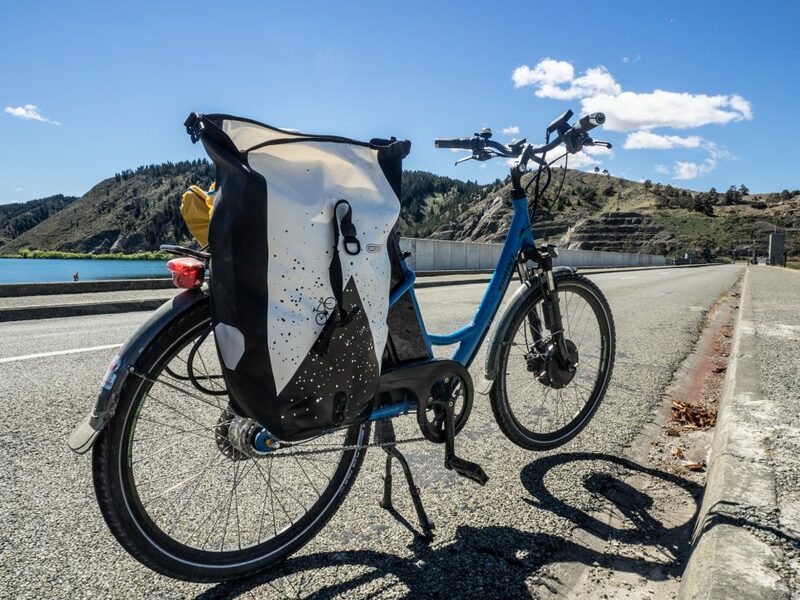 Each bike was fitted with a 34ah (1200wh) battery and an Ortlieb pannier with an appropriate mountain-snowflake pattern. 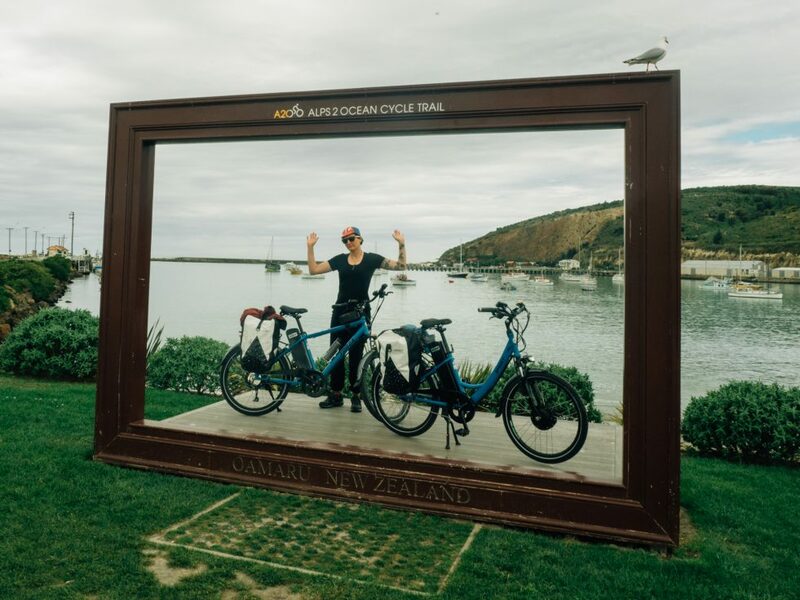 The trail started at the Oamaru waterfront and led us through a mix of gorgeous farmland and quiet country roads. We had a great time enjoying the countryside, patting animals and getting frequent glimpses of the mountains in the distance. Around the Elephant Rocks we had a standoff with a herd of cows who were blocking the trail. After some discussion, they agreed to move. But instead of moving to the side of the trail, most of them just walked further on. So we walked further on, and then they did, and then we did, and then some of the cows that had walked off the trail came back on behind us and started following. So basically we all just herded each other along the trail for about half an hour before getting to a cattle stop where they finally gave up and wandered in to a field and let us get back on our bikes. We arrived in Duntroon about 6pm. I hadn’t booked anywhere to stay, but I was kind of assuming we’d stay at the Duntroon Hotel. Unfortunately it was closed for renovations. Panicking slightly, Talia & I took turns calling B&Bs that advertised in the Duntroon information shack. We got a variety of responses from “not tonight” to no answer. Just as we were starting to think about riding the 24km to Kurow in the dark, we were relieved to get a callback from Rachel at The Constable’s Cottage offering her hospitality for the night. We were up bright and not very early, full of breakfast and with our bike batteries fully charged. There was more lovely scenery on our first leg of the day, from Duntroon to Kurow. There were also some river crossings and getting lost. 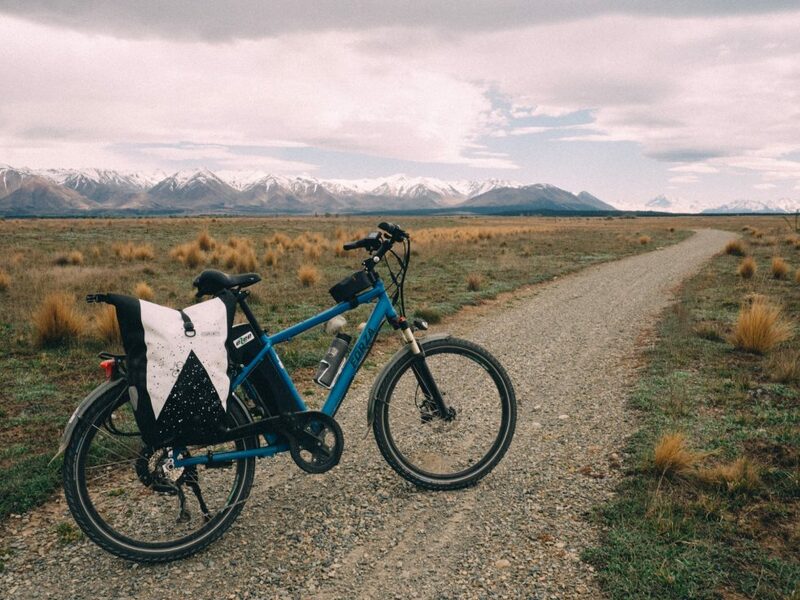 Here’s a surprising fact about e-bikes with throttles – they are excellent when crossing rivers because you can use them instead of pedalling and keep your feet from getting wet. We arrived in Kurow in time for lunch (anywhere between 11am and 4pm is time for lunch as far as I’m concerned) where there were several nice looking cafes. We chose the one that had the unusual feature of a vast croquet lawn. But we didn’t play any croquet, we just had lunch. 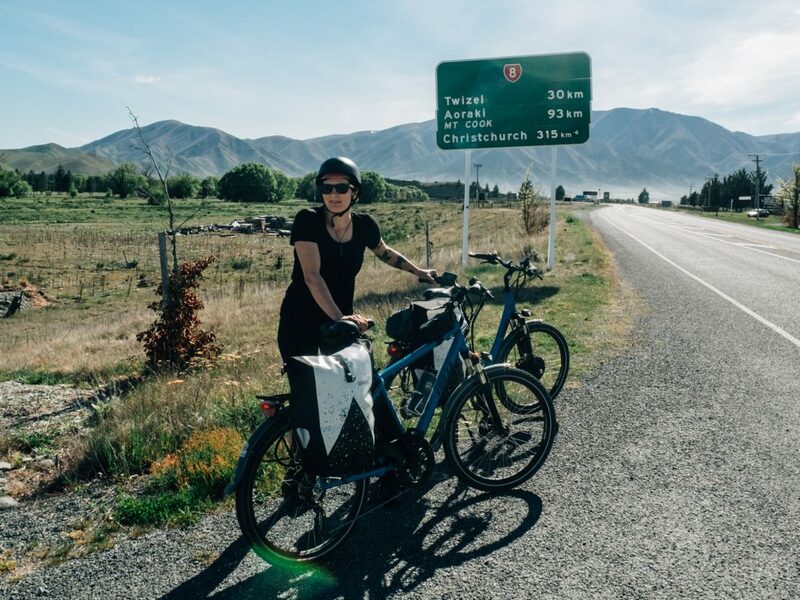 Back on our bikes, we rode out of Kurow on a trail that followed the road up & over a hill, before taking us along the road over the Aviemore Dam. The road around the back of Lake Aviemore was particularly beautiful, and the Waitingi Campground was starting to fill with caravans. Apparently lots of people in Oamaru reserve spaces there for the summer. More notably though, I stopped to wait for Talia and found two dollars on the road! One of the many advantages of cycle touring over travelling by car. 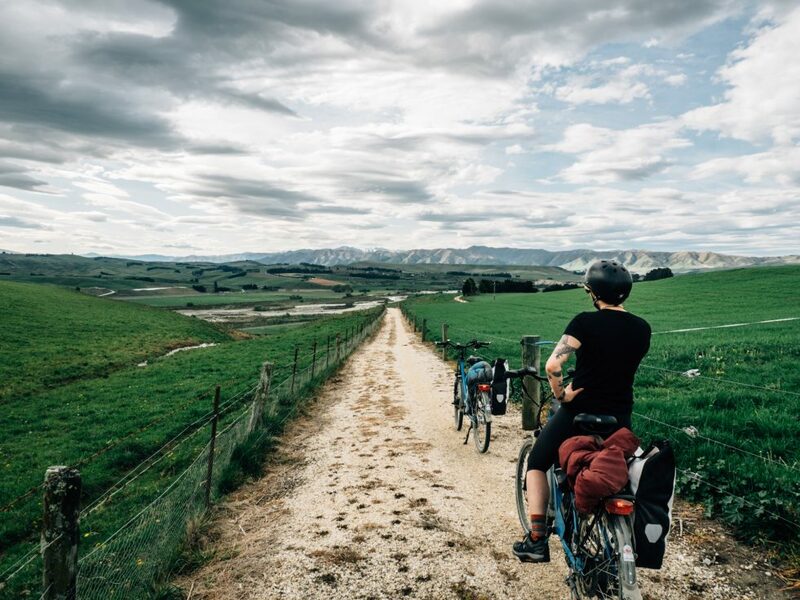 After riding over the Benmore Dam, we stopped in Otematata for an ice cream, then we were back on the road, arriving in Omarama in the late afternoon. The very friendly proprietor of the motel where we stayed, gave us a beer when we arrived, apparently this is a treat for all of his guests who arrive by bike. This hospitality was the complete opposite of a dog we met, sitting outside a superette there, who, when Talia when to pat him, got up and walked away! And then lay down a few metres further along. Maybe he had been told not to talk to strangers. Leaving Omarama, the trail followed the highway briefly, before taking a left turn down a quiet gravel road, that eventually led to a historic wool shed. We stopped there to have a snack and refill our drink bottles from a stream. We also walked through the historic wool shed and read about the old days. The old days sounded like they were really hard work. Even acquiring the land involved some kind of argument and a long race on horses, rather than the modern style of bidding in an auction. 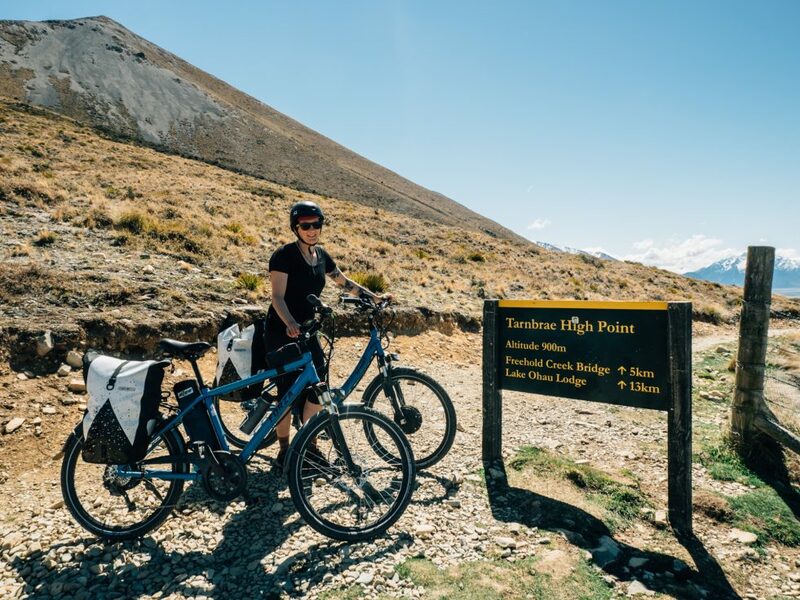 The section of the trail from The Historic Wool shed to Lake Ohau Lodge was spectacularly beautiful, with the most fantastic views across the tussock landscape to the (not very distant) mountains. The trail itself was pretty rough though – a mountain bike trail really. But my Sprint managed it extraordinarily well – it’s a very tough bike. We got to the lodge mid afternoon, hoping to find something to eat. There were a few guests lurking around but we were unable to attract the attention of any of the staff, so we gave up and kept riding. The road from there to Ohau was very quiet, and the trail from Ohau to Twizel was gorgeous. It runs along the edge of a beautiful lake and there are spectacular views across to the scree covered mountains. Also, we patted a donkey. 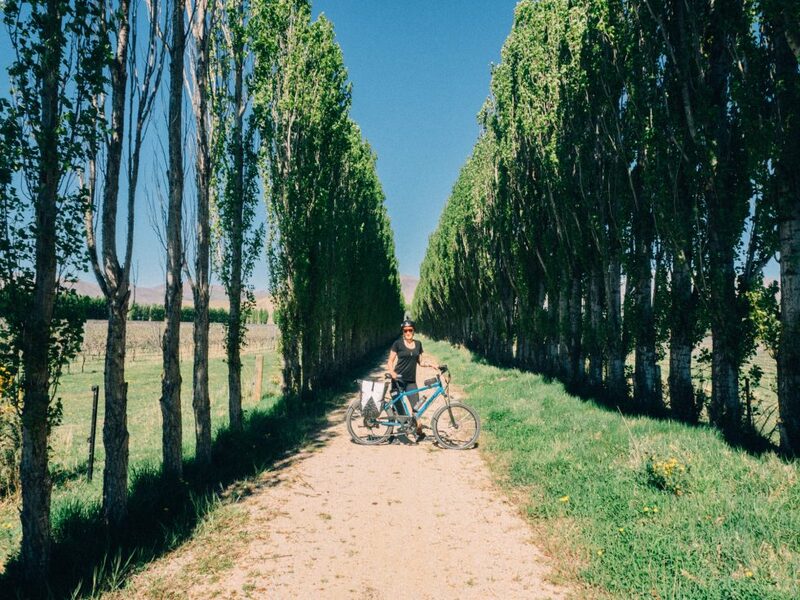 We were a little bit lucky finding accomodation in Twizel – we arrived the day before a big multisport event that meant most places were booked out. As we left we could see lots of lean looking people driving cars covered in multiple kayaks and bikes. The days trail started with a flat gravel ride to a shop next to a lake, that was selling a lot of salmon to tourists. There was also a nice visitors centre where we spent quite a long time rescuing a bumblebee that had gotten trapped behind some glass. Once the bee was free we continued riding, past lots of power generation infrastructure. Parking your electric bike next to a hydroelectric dam, gives you a kind of full-circle feeling. Like a salmon that has made it all the way up stream. 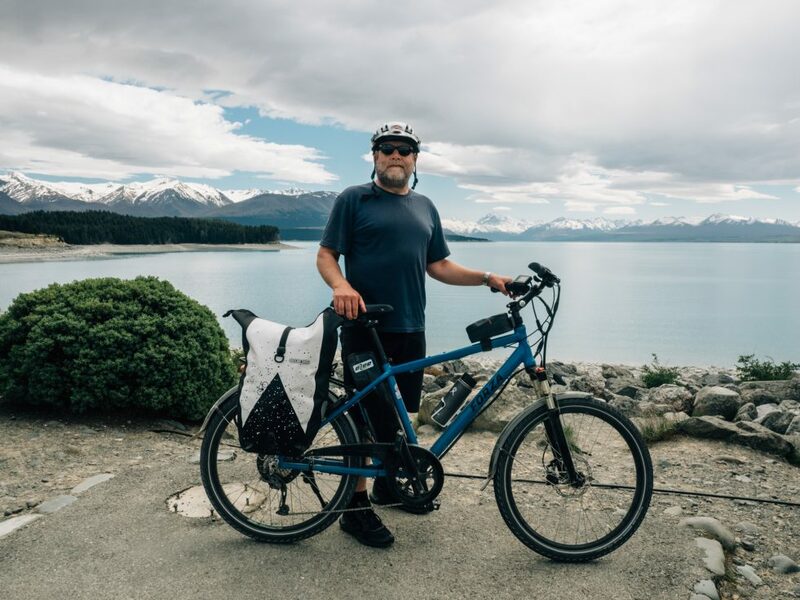 As we passed the Tekapo B Powerstation I imagined that there was freshly generated electricity floating in the air around our bikes, trying to make them go faster. And I missed the turn off that we were supposed to take towards Tekapo town. Instead we headed off toward Mt Cook. After about 15km on a washboard gravel road we started to get that ‘have we gone the wrong way?’ feeling. It’s something I’m very familiar with. So we backtracked to Tekapo B and took the right turnoff. From there we cycled next to the huge canal that feeds water to the generators, and escaped salmon to locals, tourists and birds. While riding, we got talking to a couple of mountain bikers as they were passing us. 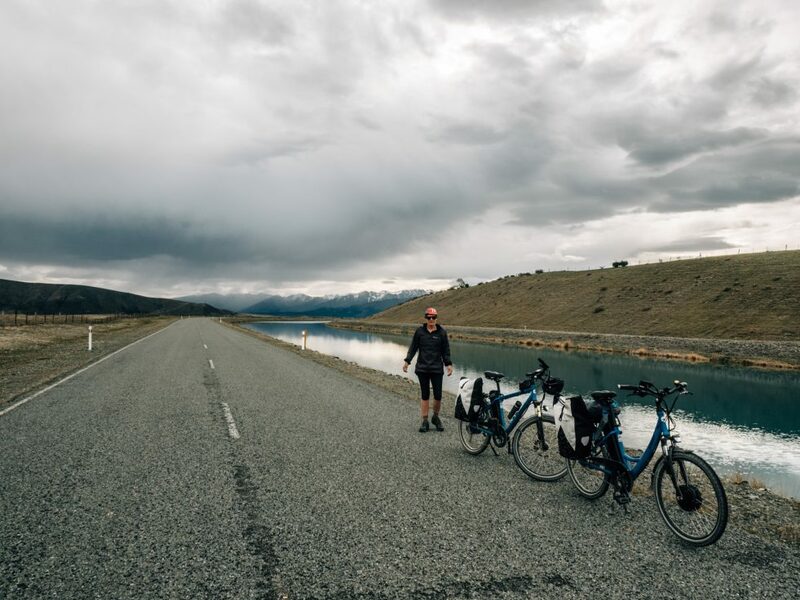 They were from Tekapo and had cycled 54km to Twizel to compete in a race and were now riding another 54km home. I asked if she had won the race. She had. I was very impressed. In the late afternoon, we arrived in the lakeside town of Tekapo, and rode past the real life postcard that is The Church of the Good Shepherd, to our accomodation for the night. 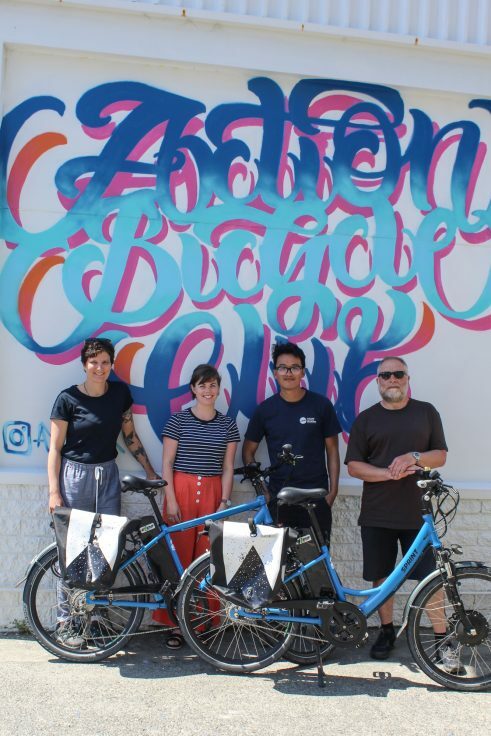 We loaded Little Blue Sprint and Captain Forza (as we now thought of them) on to an Intercity bus that took all of us back to Christchurch, where we dropped our bikes off at Action Bicycle Club, in the safe hands of Ken & Charlotte. Both eZees had proved themselves reliable and capable companions. For this kind of journey, we found the new torque-sensing T4 system on the Forza (but also available on the Sprint) was a more satisfying ride. But the classic system definitely gets you where you want to go. After spending so much time with them, we were a bit sad to be saying goodbye to LBS and CF, but I’m sure they’ll have many other adventures with other people soon. 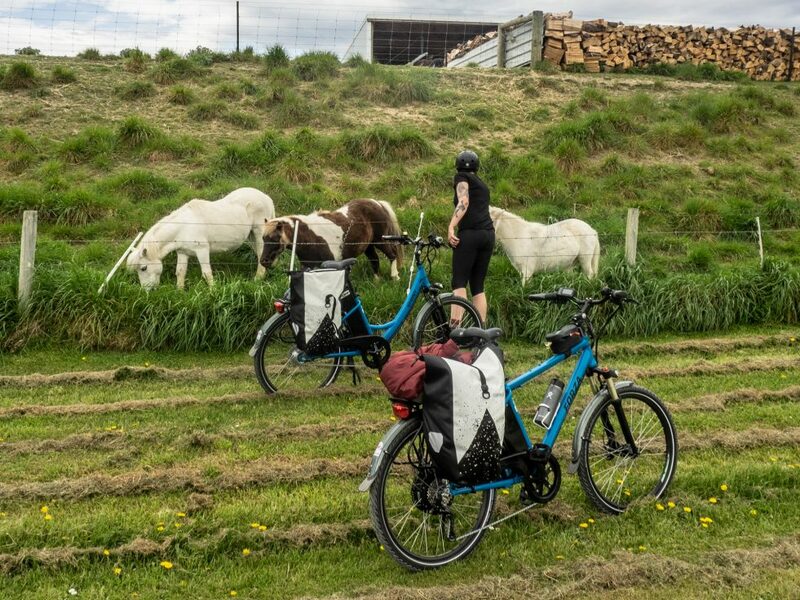 Next post: Electric Bike Touring info evening!